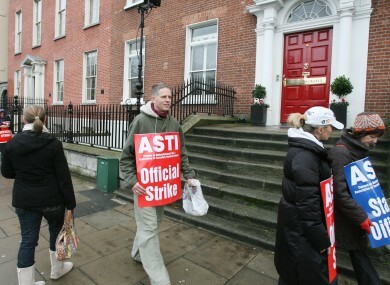 Workers on an official ASTI picket outside Loreto College in Dublin in 2009. ASTI REPRESENTATIVES WILL meet with officials from the Department of Education tomorrow as efforts to resolve their ongoing dispute took a step forward. Tomorrow’s discussions came about as a result of informal talks that took place between the parties last week. The ASTI’s 23 person standing committee met today to be briefed on those informal talks and decide whether there was basis to enter formal negotiations. In a ballot of its members in September, secondary teachers of ASTI rejected the Haddington Road agreement and voted for industrial action which meant they refused to attend meetings that took place outside of normal school hours or take on any extra duties without additional pay. The industrial action will not be halted while the discussions take place with an ASTI spokesperson saying that such a gesture would be discussed as the talks progress. The nature or tomorrow’s talks are as yet unclear but the Government has previously ruled out any renegotiation of the Haddington Road deal on public sector pay and conditions. The ASTI has called a meeting of its 180 person strong Central Executive Council this Saturday to discuss the progress of talks. Email “Movement in teachers dispute as ASTI to meet department officials tomorrow”. Feedback on “Movement in teachers dispute as ASTI to meet department officials tomorrow”.